The Panthers have locked up the SEMGHL Northeast Crown for a second straight season. 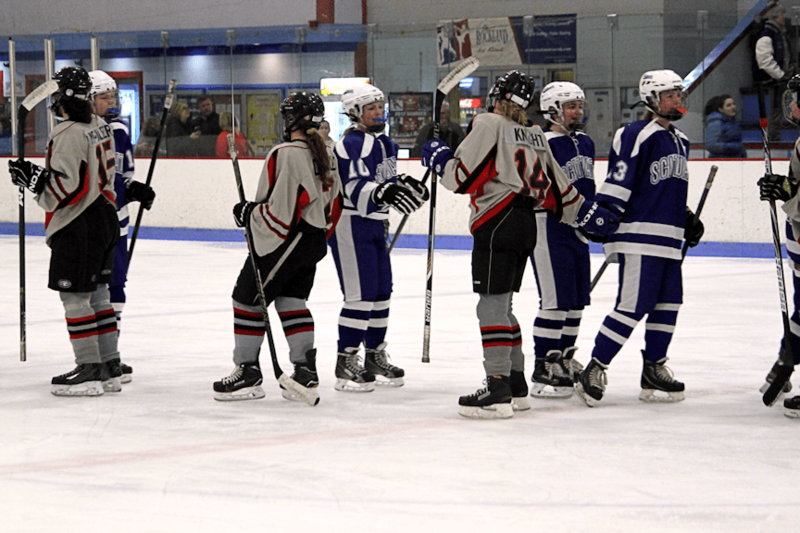 PEMBROKE – The Whitman-Hanson/Silver Lake high school girls’ hockey team continues to show unprecedented success in just its third season. On Saturday, Feb. 11, WHSL notched a convincing 9-2 victory over Scituate at Hobomock Arenas. The win gave the Panthers their second straight SEMGHL Northeast crown. Mel McAleer (Hanson) and Hannah Tracy (Hanson) combined for five goals and two assists as starting defenseman Katie Johnson (Kingston) and Delaney Grace (Halifax) rose to the occasion on the backline to power the Panthers to their third straight victory. It took WHSL (13-3-2, 9-0-1) all of 30 seconds to get on the board as McAleer was there to clean up a rebound and snipped a shot on Scituate (3-10-2, 3-7-0) goaltender Annabel Christenson that beat her stick side, pushing the Panthers in front 1-0. Just 59 seconds later, Tracy lit the lamp with a goal that beat Christenson top shelf, glove side off an assist from captain Mary Kate Webb (Kingston) to make it 2-0. Alyssa Murphy’s (Kingston) 16th tally of the season extended WHSL’s cushion to 3-0 3:41 into the contest. Tracy and Webb added two more goals in less than a minute as the Panthers held a 5-0 advantage at the end of the first period. At two minutes into the second frame, sophomore Zoe Lydon (Hanson) joined in on the offensive outburst with her second goal of the season, off assists from Emily Knight (Whitman) and Sarah Govoni (Hanson), making it a 6-0 game. “We wanted to go out and have a good solid first period and [we wanted to] get all the girls that come to practices at 5 a.m. and deserve [it] to get in the game and we did,” Marani said. Two quick WHSL penalties put the Sailors on a 5-on-3 power play, and Alaina Roman was finally able to break through Panthers netminder Mellissa Crone (Kingston) for a goal to pull Scituate within five, 6-1, with 6:35 remaining in the second period. “It was at that point and they had 5-on-3 and we were just having fun at that point, so it was lack of breakdown probably,” Marani said. Unfortunately for the Sailors, who were still on the power play, WHSL was far from done and Tracy’s short-handed goal less than a minute later, giving her a hat trick – made it 7-1. Both teams would poke home one more tally apiece as McAleer and Liv Haley found the back of the net to make it an 8-2 game at the end of the second period. Sophomore Maddie Soule (Hanson) capped the scoring with 5:09 remaining in the game with her first goal of the season to push WHSL’s lead to 9-2 and that’s where it would stand. “We have a good group of young talent and they’re learning from very good players,” Marani said. WHSL’s one tie in the league came in a 2-2 decision against Cohasset/Hanover Wednesday, Dec. 21. The Panthers have pumped in 27 goals over their past three outings and are outscoring opponents 97-36 through their 18 games.